Michael F. L. Allen, partner, was one of two break-out group moderators at CARIBAVIA: The Caribbean Aviation Meet-up held on 12-14 June at Atlantis, Paradise Island. 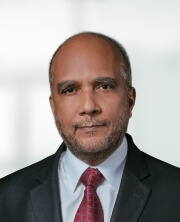 Mr. Allen is the chairman of the firm’s aviation practice group and also chairs The Bahamas Air Transport Advisory Board which advises the Minister of Tourism and Aviaton on matters connected with the granting of air transport licences. Leading the session on aircraft registration, Mr. Allen said, “The Bahamas is poised to enter a new and exciting phase in the development of its aviation sector as it begins to consider enhancements to its aircraft registry.” His presentation placed particular emphasis on a review of the best of the best offshore jurisdictions for the registration of aircraft. Participants were taken through an overview of reputable, profitable and innovative aircraft registries. He noted indications of the Minister of Aviation’s commitment to the creation of a designated registry for registering interests in aircraft, and anticipated that the jurisdiction will also give attention to issues relative to the ratification of the Cape Town Convention, which concerns the recognition of International Interests in mobile equipment and matters specific to aircraft equipment.